In the I don't believe it's true department it seems that the dictator handed over power temporarily. Let's see what happens, since we have been burnt many times. 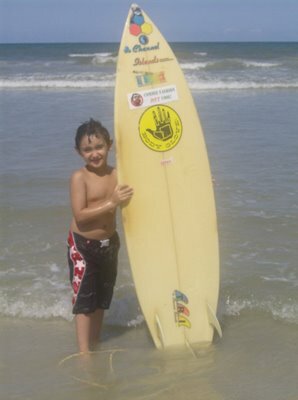 Those who call themselves surfers know the awesome feeling of freedom while riding the wave. Nothing better than catching a glassy 4 to 6 foot wave and thanking God for this gift of freedom. When will we see the innocence and freedom seen in this child in Cuba? When will Cuba be FREE to surf the internet? 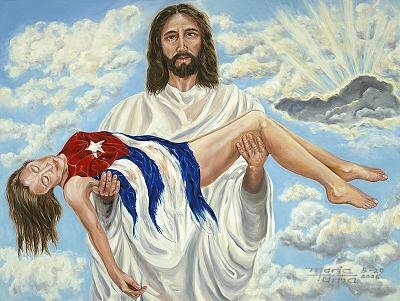 Why are the basic God given rights still not available to the Cuban people? Dude, it's time for FREEDOM in Cuba! Here is an article from Forbes detailing the lack of faith in Cuba. I would like to express an apology for several reasons. I made a solemn promise to a special person concerning the fight for a FREE Cuba. I have had personal struggles and health problems that required a surgery and thank God everything will be fine. I want to apologize for my post not being up to par lately, and for those who struggle daily with imprisonment and torture. Nothing in my grand scheme of things can compare of what many are going through now. I apologize to my fellow bloggers for not keeping up lately and for not being up to date. My solemn promise continues with a revived fervor and a commitment to those who have died seeking a FREE Cuba, and to my family this blog and struggle is my gift to you with all my heart! The dictator and mini-me plotting evil schemes to society while being flanked by a picture of the loser Leche Guevera. It is unconceivable that these evil doers get a free pass from the press and practically fawned over by the idiots in both the English and Spanish media. Enough of these men who hate their own people and even hate their own country. The Real Cuba has this video of the dictator showing his true colors. The nerve of the reporter asking him a un-rehearsed question or something that is not controlled! Heard a great sermon today at mass with a special message. The power of the sign of the Cross will bless those in Cuba and foster a special blessing for FREEDOM. Good will triumph over evil. We are not sure if the dictator is heading for Argentina or if he is really dead? Rumor has it if he lands in Argentina he would be arrested? I don't believe this, but check this out from La Nueva Cuba. 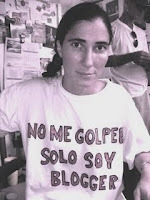 Freedom fighter Santiago Valdeolla wrote this in blood from prison. 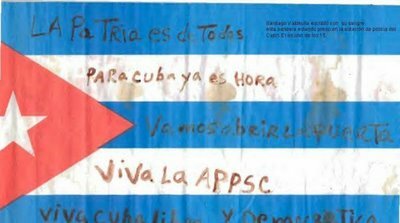 "The country belongs to all of us"
"For Cuba it is time"
"Long live a free and democratic Cuba". To all the freedom fighting bloggers to my right! My freedom-loving brethren again I am going to repeat: I do not believe the dictator is dead! If he were do you think we would be informed in a timely manner? "How is it that you have a blog, yet Farinas and Biscet are not allowed to have one or access the internet?" No amount of revolutionary jargon, portraying the U.S. as the bad guy, and 1 ruler for 47 years can justify and explain this! Here is my disclaimer: I do not believe the dictator is dead. All you commies did you hear that, but I have received many e-mails claiming that he is dead. I am sure that they are trying to wake up the dictator so he can recite some boring 4 hour slurring speech to prove otherwise. So just in case I have my special cigar ready now or for later! 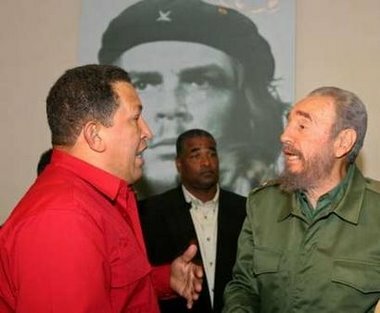 Cuba State Funeral Planning Underway? (14 Jul 06) Several sources inform WHPW Editors that amid all the speculation to the Bearded One's demise during the past week, there may be some recent activity on the island - in plain view - that is fueling speculation that the Bearded One is very ill and near death.... When the Bearded One does pass away, an elaborate statefunerall is planned, one like any other witnessed in the Western Hemisphere. "It will be a blast back to the Cold War," advises one source. "Castro cadaver will be on display and will take an 'island tour' that will either start or end in Granma or somewhere in Santiago," added the source. Hoy comienza el 2do dia de ayuno y de oracion del Dr Oscar Elias Biscet en una celda cubana. Unete en espiritu de oracion con él rogando a Dios. Feliz el que no se guia/ por consejo de malvados,/ ni pone pie en mal camino,/ ni con burlones se sienta;/ sino en la ley del Señor se deleita,/ y de noche y de día la medita. Es arbol a orillas de aguas corrientes,/ el cual da siempre su fruto a su tiempo,/ y su follaje jamas se marchita:/ ese hombre tendrá buen exito en todo. No son asi los impios; no, no asi;/ son como tamo que el viento dispersa./ Por eso no venceran en el juicio,/ ni en la reunion de los justos, los malos. Pues cuida el Señor la senda del justo,/ y la del malo conduce al abismo. En verdad, en verdad les digo: "Todo lo que hagais por el mas pequeño de los mios a mi mismo me lo habeis hecho". (Mt.25, 34b-36, 40). Rumors are swirling that the dictator is dead? As you know we have heard this many times before only to be burnt. Now it seems that the dictator in waiting brother has taken over the day to day operations and making more appearances. What does this mean? Who knows with these commies, the master manipulators! Get those special cigars and champagne ready, just in case my freedom loving brethren! My freedom loving brethren due to computer problems and personal reasons I have been away and not been able to post. I will get to your e-mails as soon as I can.